This is setup options for SMTP server send method (esmSMTPServer). They are located at Sending tab. 1. "Address(es)" (.SendSMTPServerTarget) option specifies target e-mail address to send bug report to. Specify here your e-mail address for bug reports harvesting. Multiple e-mail addresses are allowed (separate them with "," or ";"). 2. "E-mail subject" (.SendSMTPServerSubject) option specifies header (subject) for all sent bug reports. You can specify generic static text here (like 'Bug report for Project X') or use a %tag% to generate dynamic subject to distinguish one bug report from another. See using variables for more info. 3. "E-mail message" (.SendSMTPServerMessage) option is optional text of e-mail message (body). You can enter here any text, use variables or just leave this field empty. 4. "Append bug report text in the message text" (.SendSMTPServerAppendLogs) option appends bug report text to the e-mail message (body). If e-mail body is empty - e-mail will consist of bug report text only. If you've entered non-null text - the first will be your text, the next will be bug report text. Note: checking this option will not disable bug report file upload. File will still be attached. 5. "From field" (.SendSMTPServerFrom) option specifies your e-mail address. 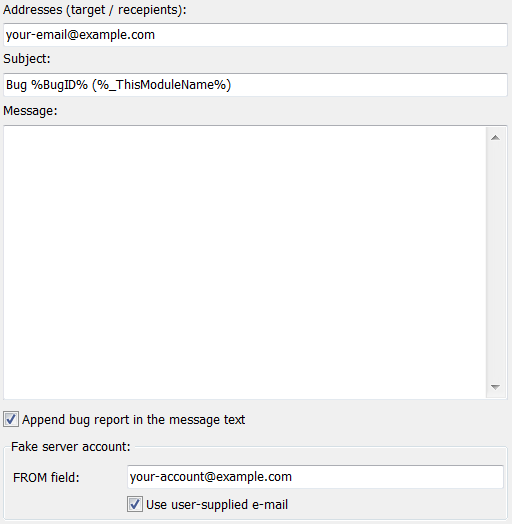 It's can be any valid e-mail address, which will be used as "sender" to send bug reports. It can be the same as "Address(es)" option, but it doesn't have to. This doesn't have to be real e-mail account. It can be anything. 6. "Use user-supplied e-mail" (.SendSMTPServerUseRealEMail) option allows you to substitute your real e-mail address with customer's e-mail (which can be set via some error dialogs or SetUserEMail function). If you turn this option on - you will see customer's e-mail in FROM field in bug reports. This is convenient. Usually, you want to keep this option checked. Important Note: you can use CurrentEurekaLogOptions.CustomHELO option to alter name to be passed to HELO/EHLO SMTP command.